Khartoum — A delegation of representatives of the Declaration of Freedom and Change, a broad coalition of opposition parties and the major force behind the Sudan Uprising, Are currently engaged in talks with the military interim council at the Sudanese army headquarters in Khartoum. The talks come after a tumultuous two days. Thursday saw President Omar Al Bashir deposed and arrested, and replaced the military interim council headed by Sudanese Defence Minister, Lt Gen Awad Ahmed Ibn Auf. However, less than 24 hours after being sworn-in as interim president, Ibn Auf himself stepped-down in favour of the less politically charged Lt Gen Abdelfattah Burhan, Inspector-General of the Armed Forces, who was sworn-in as new interim president on Friday evening. This morning, it was announced that Salah Abdallah (aka Gosh), director-general of the Sudan's NISS, has resigned. 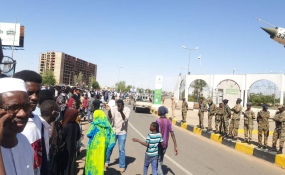 The Declaration of Freedom and Change forces have rejected the seizure of power by Sudan's military, and reiterated their long-held demand for an immediate handover to a civilian transitional government at a press conference in Khartoum this morning. In a statement this afternoon, they said they received a call from the Armed Forces Command for a meeting on Saturday 13 April 2019. "We have decided to accept the invitation to sit at the negotiating table for the purpose of the transition to a civil authority that will implement the provisions of the Declaration of Freedom and Change in full accordance with the demands of the inevitably victorious Sudanese revolution." The delegation will consist of Omar El Degeir, Maryam El Mahdi, Siddig Yousef, Ali El Sanhouri, Mohamed Naji El Asam, Ahmed Rabee, Ayman Khalid, El Tayeb El Abbasi, Hasan Abdelaati, and Madani Abbas Madani. The statement concludes that "the glorious December Revolution will reach its goals by adhering to our unity and the means of peaceful resistance" and adds that "we will not deviate until the demands of the revolution are fully implemented". In a separate statement today, the allied Sudanese Professionals Association, which has been the spearhead of the uprising since December, announced that Mohamed Naji El Asam, Taha Osman Ishag, Ahmed Rabee, Ibrahim Hasaballah, Gumriya Omar, and Mohamed El Amin Abdelaziz will form its negotiating team.